Warner Brothers was always a steadfast fixture of strength and empowerment within the our apparel company. We've had numerous opportunities to showcase these fierce girls throughout my career and the below were two of my favorites. The first being impactful due to the visibility we garnered via the Los Angeles Times article, and the second, due to the proximity it had to the release of Wonder Woman the feature film. I loved the movie and getting the opportunity to play in their world. Below is one of the splash pages from the Evy of California official homepage; this, along with another collection I worked on as a Senior Graphic Artist, (My Little Pony), were two of the collections visible upon entry to our site. 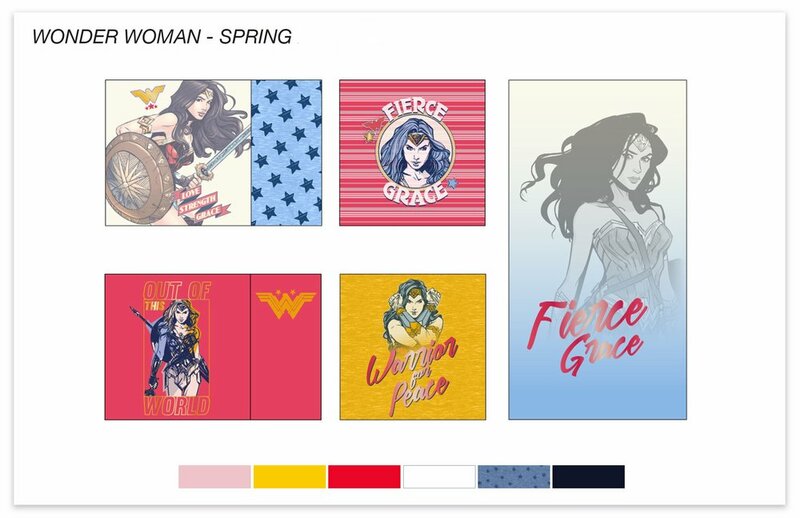 This Spring Collection was one of the first DC groups I worked on from start to finish. It was a bright blend of classic and retro, with fun fabrics and treatments. 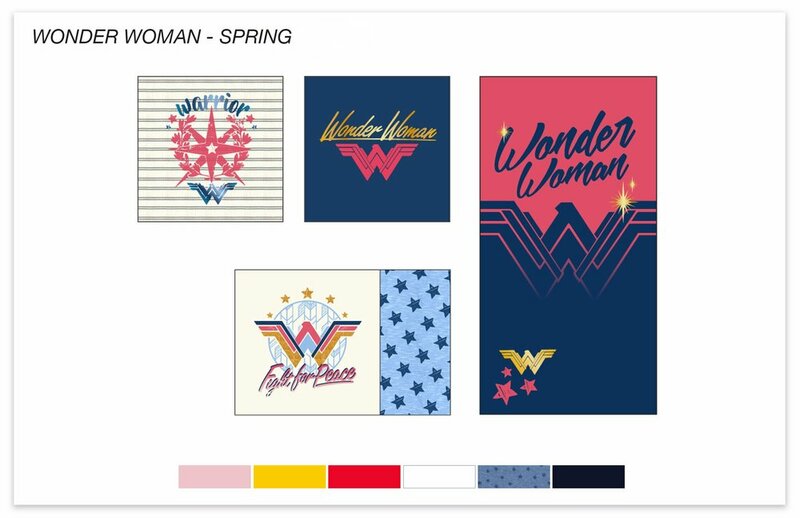 The below garments were merchandised, with my graphics, by designers and the creative director for Target. 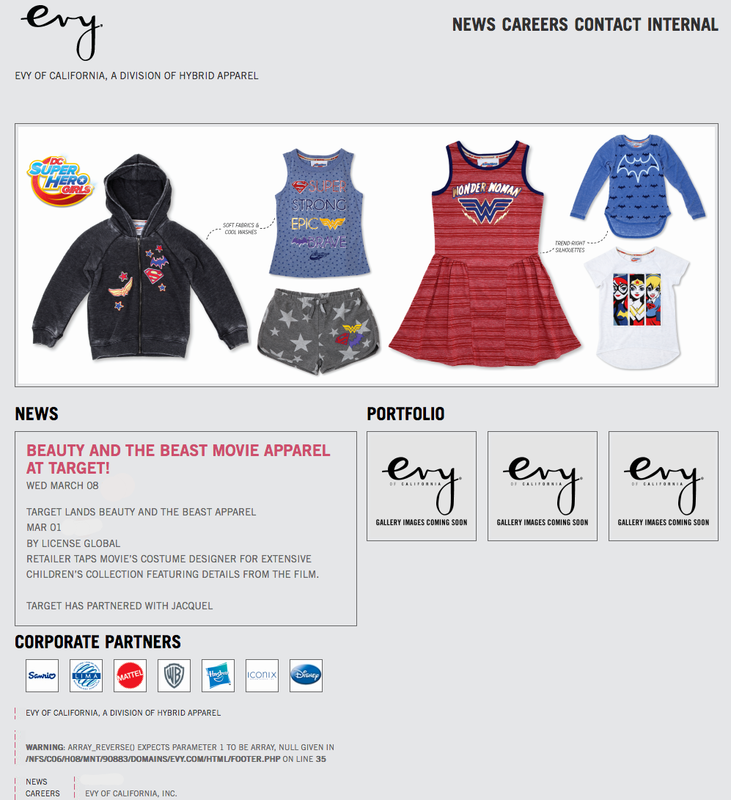 Our Target Collection ultimately made it to the front of LA Times' online magazine. Teamwork made the dream work - as you can see, the background of President Diane Nelson's photoshoot is peppered with garments done by Evy Graphic Artists, including 3 of my pieces. Round 2 of my adventure into Wonder Woman's world. This collection was also formally pitched, and expounds more specifically, on the process that led us from concept to execution. Establishing the look and feel early on is essential for continuity. Is our girl sweet? Spirited? Athletic? Maybe she's all three. After all, isn't that what these heroes are all about? Stage 1 of any collection usually revolves around establishing really good visuals. Placement, treatment, fabrics - these can fuse a great concept, but first, make great art. Box form seems to be a winning platform for visualization and editing. Stage 2 is where the magic starts to happen. This is usually when we start adjudicating whether or not placements are possible, which garments work and which don't, where the balance in the collection peaks and where we can be inventive. For this particular collection, we did two full spreads with DCSHG graphics AND Movie art as a means of showing how we can endeavor to successfully navigate different art styles. Both were strong, bold, and a lot of fun.